Wilfred Davis Fletcher (1922 – 2016), a third-generation Idahoan and long-time friend and supporter of the Boise Art Museum, had an inspired collecting vision. Unconstrained by conventional collecting practices and the whims of the art market, he enjoyed discovering new facets of an artist’s work. His unique eye and open-mindedness led him to collect artworks across a variety of media—including ceramics, drawings, glass works, paintings, prints, and sculptures. Mr. Fletcher understood the distinctive allure of collecting, and continued to purchase art until his final days. We celebrate his life and his passion for collecting with this special exhibition, which features artworks from his recently received bequest alongside earlier gifts, all of which he lived with and loved for many years. The works in this exhibition demonstrate his commitment to supporting modern and contemporary American art and artists. Mr. Fletcher donated his first gift—a small graphite drawing by Maynard Dixon—to the Museum in 1984. In the years since then, he has made seventeen additional donations to the Museum, totaling nearly 600 works of art. His incredible generosity has significantly shaped the Museum’s Permanent Collection of approximately 4,000 objects, by introducing artworks by prominent artists who were previously unrepresented. The Permanent Collection is at the heart of what we do at the Boise Art Museum. We are fortunate to have a strong body of artwork from which to draw for exhibitions and educational programs. The Museum is grateful to Mr. Fletcher and proud to have collaborated with him to benefit our community for generations to come. 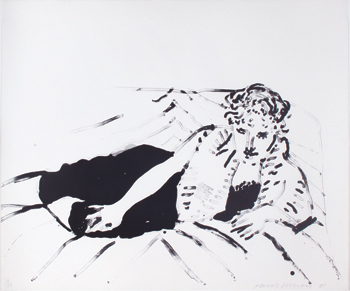 IMAGE: David Hockney, Big Celia Print #1, 1981, one-color lithograph on Arches paper, 36/100, 47″ x 56″, Collection of the Boise Art Museum, Gift of Wilfred Davis Fletcher, 75th Anniversary of BAM.